The project is structured into nine Work Packages (WP). The first four of them are devoted to the development of the new VEEP solutions concurring as a whole to the manufacture of ecoinnovative precast concrete wall panels for increased energy performance of buildings. 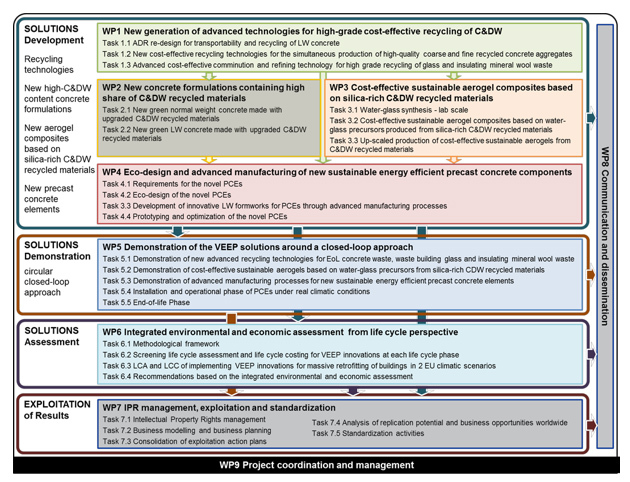 WP1, which aims at the development of the new advanced technologies for high-grade cost-effective recycling of C&DW. WP2, which aims at the development of the new NW and LW concrete formulations containing a high share of C&DW recycled materials. WP3, which aims at the development of the new aerogel composites based on silica-rich C&DW recycled materials. WP4, which aims at the development of the new eco-innovative precast concrete elements through the smart combination of green concrete, cost-effective aerogel composites and 3D printed plastic sides and shuttering pieces, for both recladding and over-cladding, relying on eco-design approaches and new manufacturing technologies. WP5 includes an ambitious demonstration programme aiming at demonstrating all of the VEEP solutions around a circular, closed-loop approach. WP6 will assess whether the developed alternatives are environmentally and economically more sustainable than current products, processes and practices. WP7, on the basis of the conclusions from the previous WPs, will formulate policy and standard recommendations supporting the market uptake of those solutions. Furthermore, it will devote several activities to paving the way for the exploitation of the generated innovations though business modelling and business planning aimed at the consolidation of exploitation plans and the management of IPR. WP8 will be aimed at disseminating and communicating results to relevant stakeholders and the public. WP9 will be finally devoted to ensure a smooth coordination of the project and of the project team for all-round performance of VEEP and a fluent communication towards the Commission.